RHINOS - DID YOU KNOW? 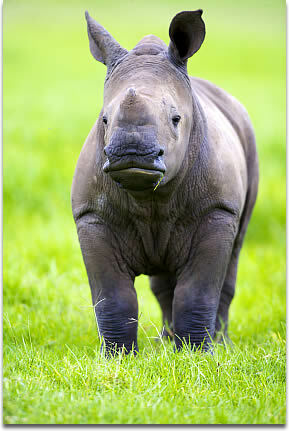 The rhinoceros, most often called a rhino, is found in various countries throughout Africa and Asia. The term “rhinoceros” refers to a group of ungulates characterised by their uneven number of toes. Currently, this group consists of five individual species, since the others have become extinct. White Rhino at Wildlife Game Reserve Plettenberg Bay,South Africa. Rhinos are particularly large animals with leathery, thick hides that protect them from the bushes and branches within which they live. Their skin varies in thickness from a little less than two centimetres to about five centimetres. 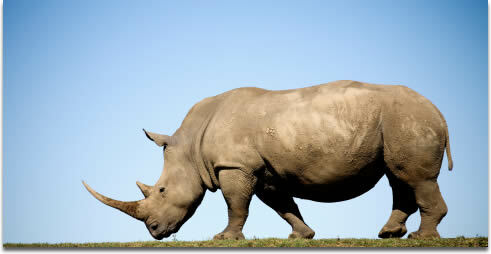 Rhinos average a weight of at about one tonne. These gorgeous beasts boast a huge horn on the fronts of their faces. This horn is made of keratin (as is human hair) and is very valuable on the black market. It is sold for its perceived medicinal uses, as well as for speciality ornaments. Some cultures believe that the horn increases virility and can cure a number of illnesses, itemprop="url" although there are no formal medical studies to prove this. The poaching of rhinos for their horns is the reason that they face the very real threat of extinction. The Black, White and Sumatran Rhinos all have another, much smaller horn in addition to this large one. Rhinos are herbivorous animals, which means that they eat only vegetation and never kill prey for food. While they prefer soft, sweet green leaves, they are able to digest far tougher plant material too. This is ground with their hind molars. They also prefer the leaves of trees and bushes, but they will certainly graze on juicy green grass too. The eyesight of a rhinoceros is particularly bad, since it does not need to have excellent vision (like most hunters do to see their prey from afar). Rather, rhinos rely far more heavily on their well-developed sense of smell and hearing. This enables them to find food and keep aware of potential dangers around them. A close-up of a White Rhino calf. Rhinoceroses are not pack animals. Rather, they prefer to live on their own, whether male or female. They will find and establish their own territories, and defend this territory actively. Male rhinos are more likely to fight to defend their territories than their female counterparts. A rhino in the wild will live up to about 35 years of age. When in captivity, this lifespan will increase by a few years because of the access these animals have to medical care and regular, heitemprop="url" althy food. In addition to poaching at the hands of human beings, rhinos are also threatened by predators (such as lions and hyenas) and the loss of habitat (which, in turn, means a loss of food). As one of the world’s most endangered species, it is imperative that countries like South Africa work harder than ever to implement effective conservation strategies and serious legal repercussions for those involved in the poaching of these giant beauties.